I may have a legitimate addiction to pretty linens. 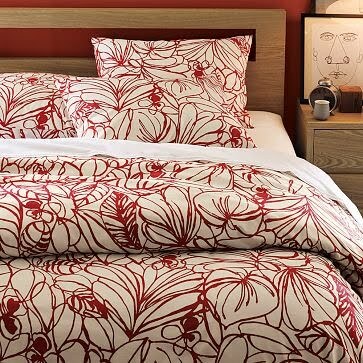 I am in zero need of new bedding after a semi-recent and beloved purchase from Dwell Studio, but would you look at this red sketch design taunting me from West Elm? It's been on my radar ever since the fall line was released a few months ago. Does anyone have more than one duvet for your bed? Can someone please validate this potential purchase before I go ahead with it? My current justification (other than thinking it's pretty) is the seasonally festive color. Oy vey. love the red! yep, i have two. i get bored easily with decor, so i like to change it up every few months. i also love bedding! i think it's nice to switch it up a bit :) def. worth the purchase. Okay, you've all convinced me. Thanks for the input ladies, you are very influential. How gorgeous-I'm in love! I admit, John and I have only one duvet, but it's because finding one that coordinating with the rather odd painting above our bed was an epic struggle! Kayla, my friend, you totally need to go for it! 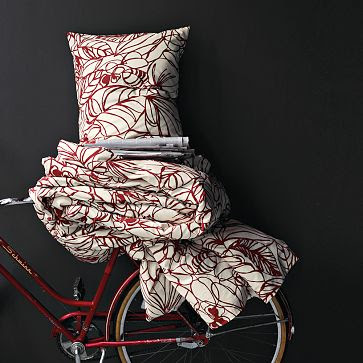 Embrace those linens, girl! P.S. The bike is kinda cute, too!